Nearly 3,000 years before the English poet Robert Herrick evoked the torment of a crushing headache and the yearning of its sufferer for relief, scientists and philosophers had deliberated over the mysteries of a pounding cranium. Throughout human history, people have struggled in the throbbing grip of migraine — a particularly vicious form of headache. It only is recently, however, that researchers have begun to fathom the biological mechanisms of the complaint. With their increased knowledge, they now are better able to offer sufferers real hope for a cure. When she got home, she took some over-the-counter pain meds and lay down for an hour. The headache, a directed, driving pain that took over the entire right side of her head, finally passed. This same approach worked with the next monster headache, which struck a few months later, and with the ones that came after that. But by the time Alsberg moved to Los Angeles, a few years later, the migraines had become more frequent. At the same time, the increasingly potent medications that doctors prescribed for her weren’t working. 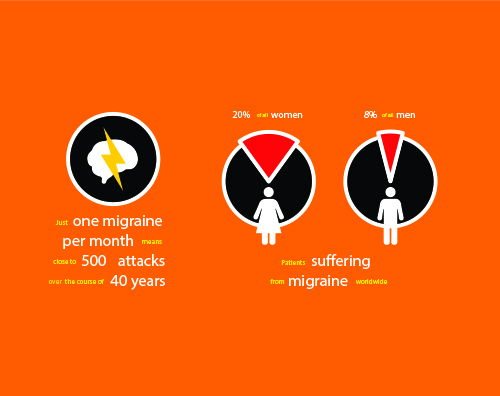 MIGRAINE IS A COMPLEX NEUROLOGICAL DISORDER in which headache is just one symptom among a web of symptoms. In addition to the crushing pain, which often throbs or pulsates, sufferers can experience nausea; dizziness; neck pain; sensitivity to light, smell or sound; visual disturbances; sensory hallucinations; mental confusion; depression; difficulty speaking; and acute exhaustion. With so many interlocking symptoms, it is not always easy to describe what a migraine actually feels like. Several years ago, the news and blog website Huffington Post asked followers on its social communities to try to put into words their experience of a migraine. “Like my brain is exploding, someone took a baseball bat and beat the base of my skull and neck with it, and there’s an ice pick jabbed into my right eye and temple,” one reader responded. “Every bright spot of light and every minor sound sets the entire back of my head on edge. The source of the noise or light becomes irritating and aggravating to me beyond anything else I ever experience,” wrote another. “Thunder and lightning inside of your head combined with a serious need to toss your cookies,” another reader wrote. Despite centuries of inquiry, the physiological origins of the condition that lead to such excruciating descriptions have been elusive. Today, Dr. Charles is a leader in the effort to more fully understand and treat migraine. 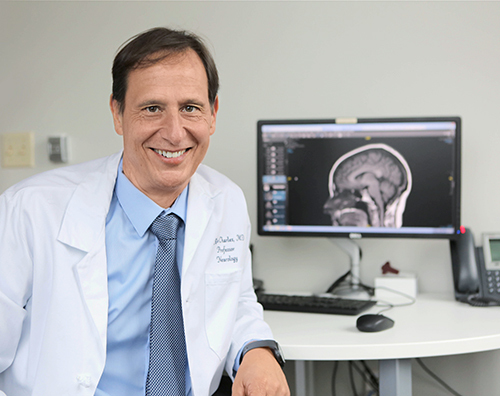 He holds the Meyer and Renee Luskin Chair in Migraine and Headache Studies, the only endowed chair in the U.S. that is dedicated to migraine, and he also serves as director of the UCLA Goldberg Migraine Program in the David Geffen School of Medicine at UCLA. As both an active researcher and a clinician who sees patients, he is a rarity in the field. In the U.S., about 100 million people suffer from chronic headache. Of those, close to 40 percent have migraine as defined by strict criteria, although it is likely that the actual percentage is much higher. The disorder, which is believed to have a genetic component, is three times as common in women as it is in men. According to the World Health Organization, as many as 20 percent of all women and 8 percent of all men worldwide suffer from migraine. That translates not just to several days per week or month spent in unrelieved pain, but also to a significant loss of quality of life and productivity. “Tally up the time you spend disabled by this disorder over a lifetime, and it really is quite extraordinary,” Dr. Charles says. “Even for the luckiest individuals who have one migraine attack per month and lose just one day, over the course of 40 years, they have lost close to 500 days to a problem that they often aren’t bringing to the attention of a medical practitioner.” Patients who do discuss migraine with their family doctor often don’t get very far, Dr. Charles says. That is because, despite it being one of the most common of all medical disorders, the subject of headache, in all of its permutations, including migraine, merits just a few hours of lecture in medical school. Thanks in part to this information vacuum, migraine has become a common pathway for dependence on prescription opioids. UNTIL QUITE RECENTLY, MIGRAINE WAS BELIEVED TO BE A VASCULAR DISORDER caused by the dilation and constriction of blood vessels in and around the brain. As a result, migraine treatments were for decades focused on vascular effects. Most current migraine therapies initially were licensed to treat other medical conditions, such as seizures, depression and high blood pressure. It was only by chance that they were discovered to offer benefits to migraine patients. Greater understanding of the basic mechanisms of migraine has led to major changes in the focus of the development of new therapies. The search for answers goes back thousands of years. Migraine shows up in medical writings in ancient Egypt as early as 1200 BC. In 4000 BC, Hippocrates accurately described both the visual disturbances that often precede a migraine attack and the nausea that can accompany it. Attempts at a cure have included drilling holes into the skulls of sufferers in 7000 BC; acupuncture in ancient China; and blood-letting, hot irons and witchcraft during the Middle Ages. The first use of vasoconstrictors emerged in the 1920s in the form of ergotamine, a substance derived from fungi such as mushrooms. As is true of virtually all migraine treatments developed since the 20th century, the application of ergotamine for migraine was a secondary use; its original purpose was to lessen bleeding in childbirth. Today’s seismic shift in migraine research is taking place, in part, thanks to the advent of sophisticated imaging technologies, advanced approaches for the analysis of genetic factors and the development of antibodies that can act with remarkable specificity on individual therapeutic targets. With these new tools, researchers can study migraine at the molecular and cellular levels, as well as visualize specific changes in the function of the nervous system that take place during a migraine attack. These studies are helping migraine to shed its status as a forgotten stepchild of medicine and become a disorder for which there are precise and targeted therapies. What scans do show is that patients in the throes of a migraine are experiencing waves of abnormal activity that spread across the surface of the brain. There also is unusual stimulation of nerve centers deep within the brainstem. The ultimate treatment goal is a means to reduce, or even short-circuit, these abnormal patterns of brain activity before they can begin to cause symptoms. In that regard, memantine, a drug used to treat moderate-to-severe confusion associated with Alzheimer’s disease, has shown promise. The drug inhibits the type of brain activity that researchers suspect to be a migraine trigger, and it has brought relief to some of the patients under Dr. Charles’s care. On the horizon are stimulation devices that would stop a budding migraine via an electrical or magnetic pulse sent to specific nerves or regions of the brain. In fact, the Food and Drug Administration (FDA) this May approved erenumab-aooe, the first drug based on monoclonal antibodies to prevent migraines. And three other pharmaceutical companies are completing phase-3 clinical trials or awaiting FDA approval of similar medicines. Known as anti-CGRP (calcitonin gene-related peptide) drugs, all are compounds that target a specific protein in the brain that causes severe headache. ADDITIONAL ADVANCES ARE TAKING PLACE IN DR. CHARLES’S LAB, where he and his colleagues are doing research with mice that have been genetically engineered to express human migraine genes. Other research takes place at UCLA’s imaging centers, where patients volunteer to have the course of their migraine attacks mapped or their anatomy characterized. Dr. Charles and his research team also collaborate on a variety of studies with other institutions. 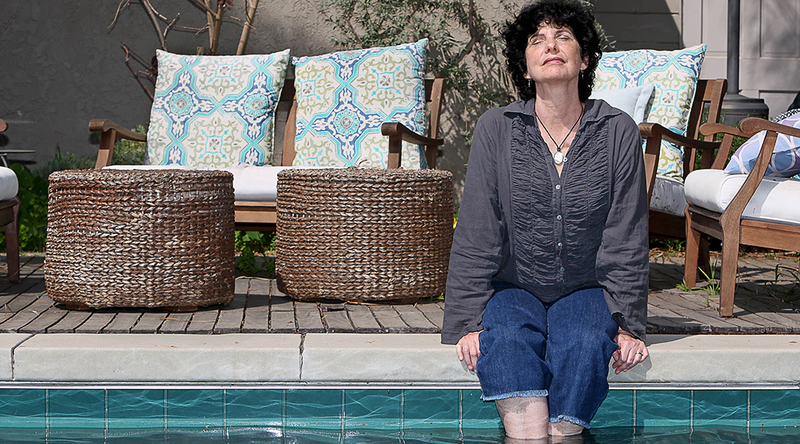 That effort is being significantly propelled by a gift from Wendy Goldberg, an author and philanthropist, and her husband Leonard Goldberg, an award-winning film and television producer and executive. 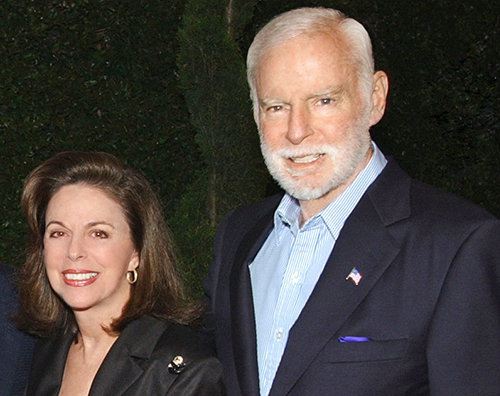 The couple recently gave $10 million to support research at UCLA, with the bulk going to migraine research. It is the largest private donation ever to support migraine research. Meanwhile, as these promising treatments progress from laboratory bench to bedside, Dr. Charles and his clinical staff work to help their migraine patients manage their conditions. New patients give a detailed oral history and fill out a medical questionnaire. They receive educational materials and undergo a physical exam. Based on the information gathered, Dr. Charles and his team formulate individualized treatment plans. Migraine education is important. Dr. Charles and his staff teach patients to recognize migraine triggers like skipped meals, irregular caffeine intake, irregular sleep, changes in the weather, air travel and emotional or physical stress. Foods like chocolate, nuts, aged cheese, fermented foods, alcohol in general and red wine in particular can be problematic for migraine sufferers. Birth control pills and anti-depressants also can play a role in migraine. Ironically, so do over-the-counter pain medications, which can ease discomfort but then cause a “rebound” headache. On patients’ to-do lists are aerobic exercise, which has been shown to reduce the frequency and severity of attacks. However, migraine patients often feel too unwell to exercise, which sets up a distressing Catch 22. Also included is a list of helpful vitamins and supplements such as Vitamin B2, magnesium, Coenzyme Q10 and melatonin. This confluence of primary research with clinical care makes UCLA’s migraine program noteworthy, says Amy Gelfand, MD, assistant professor of pediatric neurology at UC San Francisco and director of the UCSF Pediatric Headache Program. Dr. Gelfand also is a leader in the field of migraine research; her recent breakthroughs include identifying a connection between migraine and colic in babies. 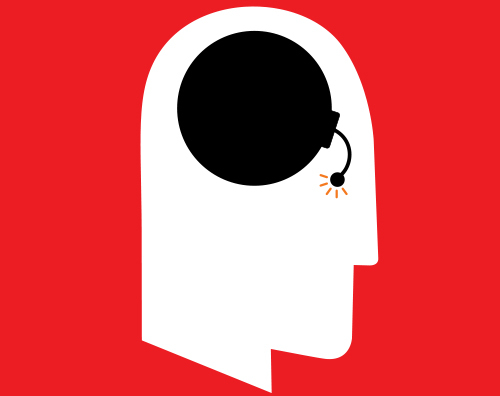 Among the recent advances in how researchers think about migraine is the idea that headache pain is preceded by far subtler symptoms like irritability, foggy thinking or scent sensitivity. Learning to identify these early-warning signals allows patients to take medication at the earliest possible moment in a migraine attack, which is key to successful pain relief. Recognizing the need to find new therapies to alleviate the debilitating effects of migraine, Wendy and Leonard Goldberg made a visionary gift to endow the UCLA Goldberg Migraine Program. News of the Goldbergs’ gift, which has enabled the program to treat a greater number of patients and accelerate research of promising migraine therapies, caught the attention of many experts in the field who have reached out to UCLA. This endowment gives scientists the flexibility to investigate the most innovative avenues and allows them to change course if new exciting therapies emerge, more quickly bringing treatments from bench to bedside. 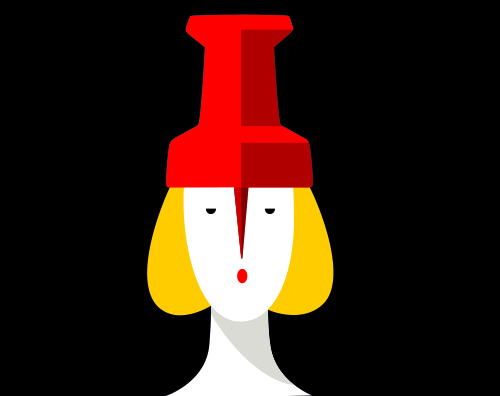 Veronique de Turenne is a freelance writer in Los Angeles. *EDITOR’S NOTE: In “The Head-ake,” Robert Herrick — familiar to many readers for the line “Gather ye rosebuds while ye may” — conjures the torment of a sufferer in the throes of a headache, but it is, in fact, a metaphor for the pain of an aching heart. This does nothing to diminish the power of its evocation. Says Jonathan F.S. Post, PhD, Distinguished Research Professor in the UCLA Department of English: “The headache points to a real thing — pain — even if in the service of a greater thing — love; both are images of human suffering. It’s a wonderful little wisp of a poem that might go some distance to relaxing the reader and curing a headache.” Here is Herrick’s poem in total. *EDITOR’S NOTE: In “The Head-ake,” Robert Herrick — familiar to many readers for the line “Gather ye rosebuds while ye may” — conjures the torment of a sufferer in the throes of a headache, but it is, in fact, a metaphor for the pain of an aching heart. This does nothing to diminish the power of its evocation. Says Jonathan F.S. Post, PhD, Distinguished Research Professor in the UCLA Department of English: “The headache points to a real thing — pain — even if in the service of a greater thing — love; both are images of human suffering. It’s a wonderful little wisp of a poem that might go some distance to relaxing the reader and curing a headache.” Here is Herrick’s poem in total. My head doth ache, O Sappho! or bring some bane to kill it. will counsel be and physic.